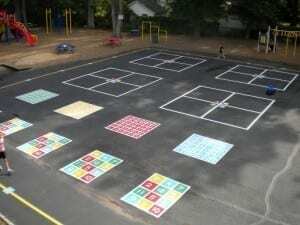 In painting school playground markings the following supplies are necessary: 100 foot measuring tape, paint, playground chalk, snap line, a taut rope on a stake for marking the radius of circles, old cloth for spills, large sticks of chalk for detail work and layout prior to painting. Color adds a great deal to school playground markings, both aesthetically and functionally. The paint colors may be selected on preference. 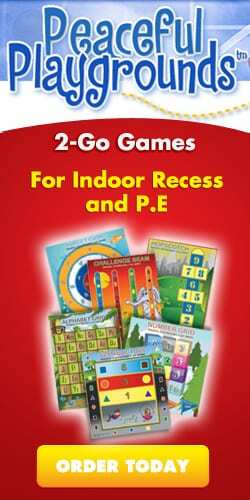 It is recommended that the primary, kindergarten, and preschool playgrounds use primary colors to enhance color recognition. 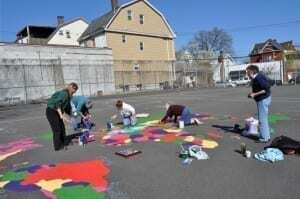 A colorful school playground is inviting and fun! 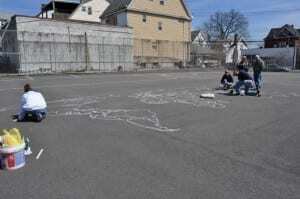 Use “Stripers” (parking lot) paint for streets and curbs. It is the most durable outdoors on asphalt. Use a well known local paint supplier. Stripers paint is available at Home Depot or Lowes . Example of a painted playground. Sweep, wash down and let the area to be painted dry completely prior to painting the designs. 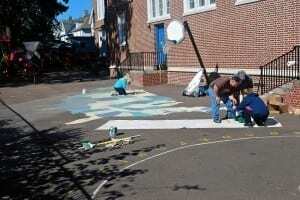 Use chalk and layout the entire playground before beginning painting. New asphalt should be allowed to cure for one month prior to painting. Use a roller for applying paint to a large surface area. Paint machines or brushes are both suitable when working with grids. Do not use a top sealer, as this could contribute to slippage. Our Playground Paint Machine is is available with 6 cans of white stripers spray paint and paint machine, for outlining all the game courts. We sell only white commercial contractors quality striping paint. Detail work is rolled on and we recommend 4 colors (red, blue, yellow, & green.) One gallon of each will be more than enough. Detail work is letters, numbers, shapes and feet. It is important to use the correct type of paint so that it will wear properly in the outdoor environment. We RECOMMEND STRIPERS PAINT OR PAINT USED TO PAINT PARKING LOTS OR STREETS! Oil based paint tends to be messy and not easy to clean up, which is why we recommend water-based latex paint. If you are having a hard time finding stripers paint then MASONRY paint can also be used and mixed to the proper color. Water-based latex paint can be specially formulated for asphalt areas and is available in many colors. This is the fastest drying asphalt-appropriate paint and will be dry to the touch in less than three hours. Oil based paint tends to be messy and not easy to clean up, which is why we recommend water-based latex paint. Be sure to sweep down the surface and then wash it down the day before painting. It is not necessary that you use a top coat or sealer. It can sometimes create slippery surfaces depending on several factors so test a small area before using. Large areas of turf are very attractive, offer a soft surface, and are most desirable for playing many games. When using both the grass and blacktop areas you spread out distribution of children for better space utilization. For lines in the grass of a permanent nature, mark the courts with a grass killer type product. Refer to your local school policy for guidelines appropriate use and safety around children. Most states have regulations as to what chemicals can be used around children. Therefore districts typically supervise any chemical that is put on grass or elsewhere on school grounds. Your grounds department or gardening crew typically have a chemical that they use to burn the lines in. We recommend you check with the people who mark your football or baseball fields at the local high school. They will most likely have an approved product for marking in the lines. A chemical burn really means a chemical that kills the grass on the 2″ line. This may in fact be a commercial weed killer. Be certain to check what products are regulated by your state. Regardless of the safety assurances, it is highly suggested that children stay off the grassy areas at least 48 hours after the grass is treated. A line marking cart is available at most high schools or district facilities departments. The U.S. Map is our most popular playground stencil.The map illustration looks approximately how your finished map will look. Follow the simple instructions for best results. Locate a section of the asphalt/concrete which is about 27 feet wide by 16 feet high. Make sure the surface is clean. Sweep and wash if needed. Unroll stencil sections 1 & 2. Start laying out sections 1 & 2 approximately 15 feet below the top of your cleared area. This will allow you room for Alaska. Unroll stencil section 2 below and next to section 1. Lay out the stencils in order 1-6. Be sure the stamped edges of the sections are aligned and the adjacent edges are close together. Unroll the rest of the sections in order, so that the final layout looks like the illustration. Note that there are TWO versions of Alaska off the west coast. 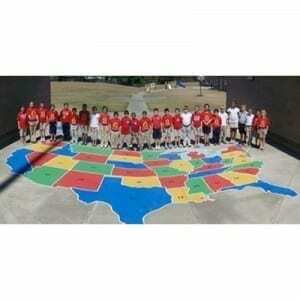 The large is done in the same scale as the rest of the states. . . Alaska is enormous. The smaller version is included for grounds which do not have enough room to paint the full size Alaska. Tape together the sections of the Alaska you wish to use. Cut Alaska out and move it above Washington as on the Illustration. Also, move the Hawaiian Islands as shown. Chalk the holes with white school chalk (recommended), or paint with spray paint. QUESTION: How do I paint the white line between the states? 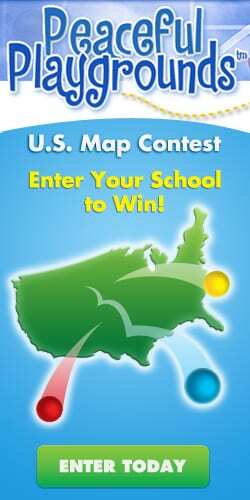 ANSWER: Painting the state lines in white is a job for a skilled painter. It will also double the amount of painting time. Put simply it is an individual choice. We see it as nice but not necessary. 1. Use 100% acrylic paint (stripers paint) or a masonry paint. We’ve found that you will need about 1/2 gallon of each color. If you are using the full size Alaska, you may want to conserve paint by only painting the outline. 4. Helpful items: sponge brushes for the borders, regular bristle brushes to paint states, coffee cans with water to wash brushes, rags, knee pads. Size 20 X 36 feet. Important: To ensure receipt of your file don't forget to add contact@peacefulplaygrounds.com to your safe senders/contact list. Don’t forget to prepare a Press Release for the community! Need some additional information? Take a look at these Resources or try our Feedback form! Download a copy of our Program Grant Writing Template. Get head start on writing a successful proposal for implementing the Peaceful Playgrounds Program in your own school. This guidebook is meant to support you in your implementation process. Careful monitoring and research conducted on the Peaceful Playgrounds program indicates proper implementation is the key factor in accomplishing the outcomes of the program. 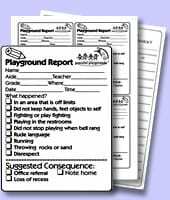 These forms will assist you in organizing and reporting on your playground activity. 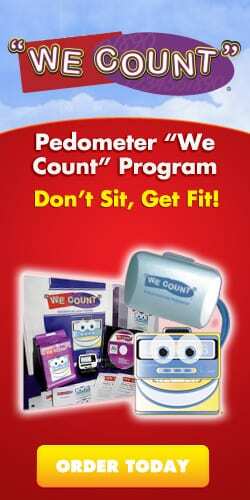 For more information on playground safety, contact The Consumer Product Safety Commission at (800) 638- 2772 or www.cpsc.gov . 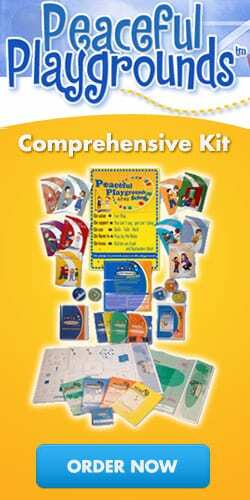 You can view the “Handbook for Playground Safety” (pdf) and the “Public Playground Safety Checklist” or get a free copy by writing to CPSC, Washington, DC 20207.